High Noon is the window to the art, the crafts and cultural legacy of the Native American Indian, the Cowboy, the Vaquero and the Old American West. Step through our window and embrace the history, the people and the romance of these rich traditions. Born in 1988, High Noon is dedicated to preserving all that encompasses our rich Western heritage and works to ensure that these traditions remain intricately woven into our lives today — to become stronger and stronger and never forgotten. Private Sales – Joseph Sherwood and Linda Kohn Sherwood as High Noon, offer over 50 years of combined experience in helping collectors both purchase and sell their Western art and artifacts. Specializing in fine spurs, bits, both historical & parade saddles, Indian artifacts and Fine Western Art, Linda and Joseph remain at the forefront of the exuberant Western Americana market. Auction Consultation – Having produced auctions for 25 years, High Noon is poised to offer guidance to those who are interested in consigning or purchasing at auction. Linda and Joseph are experts in negotiating the most advantageous plan to help their customers realize the highest dollar amount, due to longstanding personal relationships with the major auction houses. Investment & Curatorial – For those looking to purchase additional artifacts, High Noon offers help with purchasing fine Western pieces that help tell the stories of individual collections. Deaccession & Sales – Joseph and Linda have helped numerous individuals and families negotiate the complex & emotional steps of dismantling estates. With their law and teaching backgrounds, they are sensitive to the needs and steps families must face to make equitable and profitable decisions. Appraisals – High Noon offers appraisal skills to those who want to sell, who need written documents for insurance purposes and to those who give to the many Western museums across the US. High Noon (Linda and Joseph), as founders of the premier High Noon Show & Auction (1991-2014), hold multiple auction records for spurs, saddles, chaps, belt buckles. Its sales often included historical western pieces. In 2010, the company auctioned a saddle belonging to Emperor Maximilian I of Mexico, circa 1860s, for $230,000 and one in 2012 belonging to Pancho Villa for over $700,000. 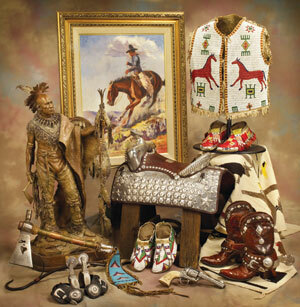 The 2013 auction featured another saddle belonging to Simón Bolívar.Auctions also frequently emphasize American Indian art. A Blackfeet tomahawk and a Kiowa beaded cradle combined were auctioned for $56,300 in 2011. In 2014, High Noon Western Americana set a record for a pair of spurs sold at auction for $153,400. The spurs were made by Jesus Tapia of Los Angeles, California in the early 1920s. The company also specializes in nostalgic Hollywood cowboy memorabilia. In 2010, an auction attendee purchased a Roy Rogers belt buckle for $69,000. Later that year, High Noon partnered with Christie’s of New York to sell the Roy Rogers Museum. Collectors of traditional visual art have acquired pieces including Will James’ Oil Painting, “Wild Horses,” selling for $149,500 in 2011, and Charlie Dye’s “Long Horn Trail,” auctioned in 2013. In 2014, High Noon sold a Colt.45 single action Army revolver used by James Arness on the TV show Gunsmoke for over $50,000. 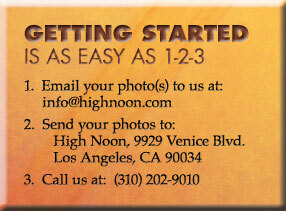 High Noon is proud to be the most comprehensive resource for both historic and contemporary Western artists. From A-Z, our database and special website offers detailed information and biographies on the likes of Edward Bohlin, Olaf Wieghorst and over 200 fine Western artists, Indian artists, Saddlemakers, and Bits & Spurs Makers whom we are honored to represent. Visit us at the High Noon Wikipedia page. Like High Noon on Facebook.